Today was supposed to be an easier day on the bike. 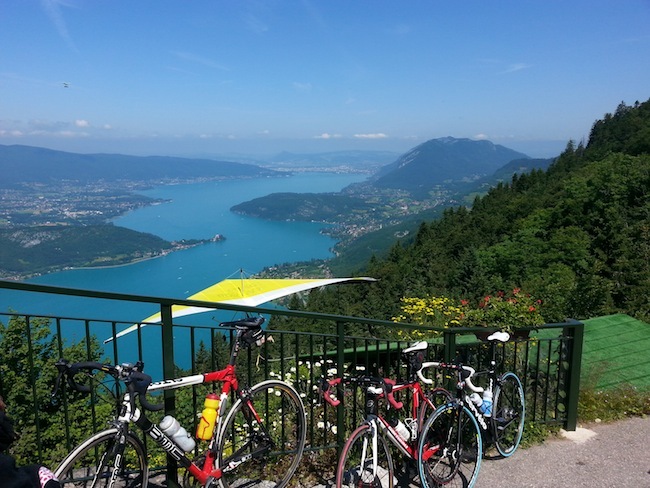 We started on the bike path that loops around Lake Annecy; it is flat and picturesque with views of the lake, mountains, and chalets that dot the shoreline. However, after a 20-mile warm-up the group we were with decided to climb the Col de la Forclaz, from the opposite direction from Day 1. Having descended this side I remembered that it was steep, but I didn't remember it being that step. In only 8 km (5 miles) we climbed 2,500 feet! 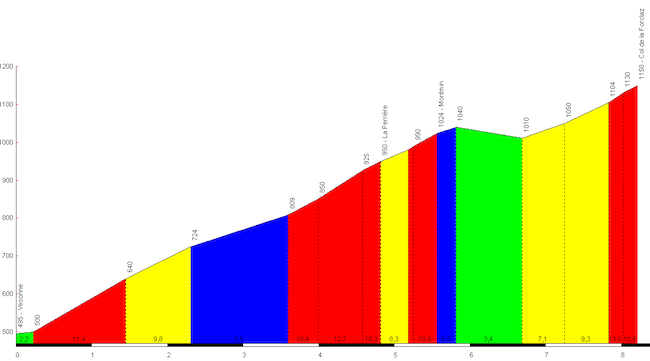 Here''s the profile - I realize that the numbers are too small to read but the red means a grade of AT LEAST 10%, and the final 2 km (1.2 miles) to the summit were 13.0 and 10.8%. It's a difficult cllmb under the best of circumstances but when your legs are as tired as mine it is a b@!%h! I was forced to stand the entire length of steep sections because I couldn't turn the pedals while seated. We stopped for cafe at the summit and watched a crazy hanglider take off by rolling down a steep ramp. I was a sceond too late with the photo but you get the idea . . . What a view he must have had! We then descended the side we climbed on Day 1. It was fast but there was a fair amount of traffic, so my top speed was only 46 mph. Back near the bottom I flatted again (third time in two days) so I decided to go straight to the bike shop in Annecy to buy some new tubes and a new cassette for more gears - I'm tired of not having an easy enough gear for the steep sections. Thankfully they had exactly what I was looking for (a 12-29, for you gearheads), installed it, and now I'm ready for tomorrow's epic climbs of the Col de Madeleine and the Col du Glandon (from the other side), two of the more difficult climbs in the Tour de France. Here's the computer data for today: 30 miles and 2,550 feet of climbing, for a total of 330 miles and nearly 40,000 vertical feet of climbing in 5 rides in France. Looks like I'll hit the 50,000 vertical feet mark!